Rescue crews are helping thousands of people who were injured or displaced after a tsunami struck the coasts of Java and Sumatra in Indonesia on Saturday night. Many residents did not receive any warning before the tsunami, which killed hundreds. Volcanic activity on Indonesia’s famous Anak Krakatau island triggered underwater landslides that caused the tsunami, officials say. Anak Krakatau emerged from the site of an 1883 eruption that killed tens of thousands of people and has drawn tourists from around the world. At least 373 people have died, with 128 missing and nearly 1,500 wounded, according to Sutopo Purwo Nugroho, a spokesman for Indonesia’s disaster management agency. Crews continue to search for survivors while retrieving bodies from the wreckage with heavy machinery and their hands, Reuters reports. The Red Cross has dispatched 22 ambulances and more than 100 volunteers to transport the injured. Blocked streets have hindered access to health centers in Pandeglang, on the island of Java, where Doctors Without Borders volunteers are helping to treat patients injured by the tsunami and falling rubble. Indonesian President Joko Widodo arrived at the disaster zone on Monday, while members of the military and volunteers continue to search affected areas. Authorities have warned residents to stay away from beaches because of the risk of continued volcanic activity. The tsunami caught residents by surprise because the country’s seismic activity detectors were not functioning properly, NPR’s Anthony Kuhn reports. Nugroho acknowledged Indonesia’s detection buoys have been dysfunctional since 2012, according to The Associated Press, a result of vandalism and budget issues. Kathy Mueller, a communications delegate with the Red Cross, was working in Indonesia when the tsunami hit — because of ongoing recovery efforts after a previous tsunami in September, which killed more than 1,700 people. She says Saturday’s tsunami affected Java’s entire western coastline. 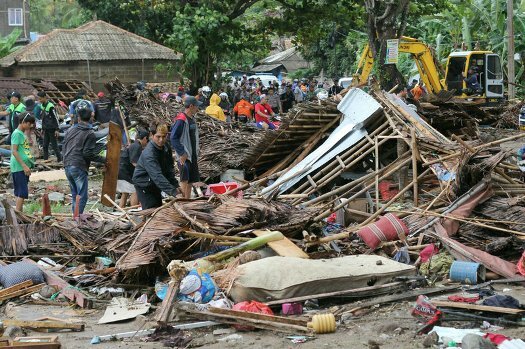 The Indonesian Red Cross dispatched more than 117 volunteers to the affected area immediately after the disaster, Mueller says. They brought basic supplies, including blankets, clothes, food and water. The tsunami struck Indonesia’s two most populous islands. Proximity to the nation’s capital, Jakarta, has facilitated the mobilization of volunteers, military and emergency personnel, compared to previous disasters. Mueller adds that emergency respondents have become proficient at purifying drinking water since the Indian Ocean tsunami in 2004, which killed more than 200,000 people. But she says three major disasters since the summer — massive earthquakes on the island of Lombok in July and again in August, followed by September’s tsunami and earthquake on the island of Sulawesi — have taxed the country, even before the latest tsunami. “People are a little bit tired now,” she says. On Sulawesi, thousands of residents still live in tented camps, according to Mueller. Now this disaster has displaced 11,000 more people in Java and Sumatra, who are residing in government buildings and camping out in tents beside hospitals. Several of the dead were members of the local pop-rock band Seventeen, which was performing at a year-end party in Java when the tsunami struck, sweeping away performers and concertgoers.